Jonathan Evans' 23rd-minute try gained the bonus point which took the Dragons to the top of Pool 3. 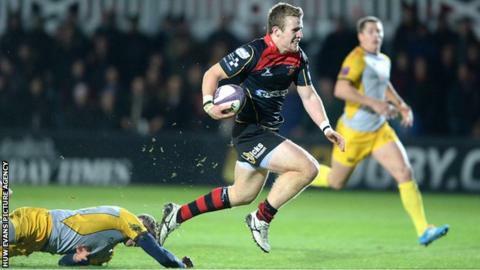 Newport Gwent Dragons moved to the top of Pool Three in the European Challenge Cup with a record win over Bucharest Wolves at Rodney Parade. After falling behind to an early try by Vali-Catalin Mototolea, Dragons secured a bonus point within 23 minutes. Wales international Tom Prydie scored three of the Dragons' 11 tries, with Geraint Rhys Jones converted seven. Jones was third-minute substitute for centre Ashley Smith, who suffered a broken jaw as he made a tackle. The son of Dragons head-coach Kingsley, Jones also scored a try for a personal points tally of 19 points. Dragons were expected to run riot against the Romanian team who are coached by Welshman Lynn Howells. But they will face tougher challenges when the pool is decided in late January 2015, when Dragons face Newcastle away before rounding off the pool against Stade Francais at home. The Dragons had made six changes from the 37-10 win in Romania, with director of coaching Lyn Jones emphasising the importance of a big win to maintain pressure on Newcastle. But the Welsh region found themselves disrupted by the injury to Smith, and then rocked as the visitors rocked them with a try which fly-half Florin Vlaicu converted. But within two minutes flanker Nick Cudd dived over for the Dragons and when centre Ross Wardle and wing Hallam Amos scored touchdowns in quick succession, the home team's dominance was established. Scrum-half Jonathan Evans's 23rd-minute try clinched the bonus point as the Romanian team - strong at the set-piece - were ruthlessly exposed in loose play. Full-back Prydie took advantage to cross for three tries as the Dragons went past their previous biggest previous win in the tournament - also against Bucharest Wolves in December 2012. Dragons head coach Kingsley Jones told BBC Radio Wales: "We made a poor start, we were inaccurate and conceded a try. "But for the next 35 minutes I think we put some good rugby together, so there are lots of positives but a lot to work on as well. "We got a bonus point and are top of the pool and that's all we could have asked from this game." Dragons fell behind to an early try before Nick Cudd claimed this score to put the Welsh region on the road to a bonus-point win. Replacements: Elliot Dee, Owen Evans, Dan Way, Rynard Landman, Taulupe Faletau, Luc Jones, Dorian Jones, Geraint Rhys Jones.